The Partiologist: Bucket's of Love! Time to get back to Valentine ideas. Even though I still don't feel 100%, these treats are completely germ free. (I made them before I got sick!) I have so much love to give I had to use three little buckets to hold it all! Years ago we had a Current Outlet in our town and I found these Valentine buckets. Now I've found a use for them. 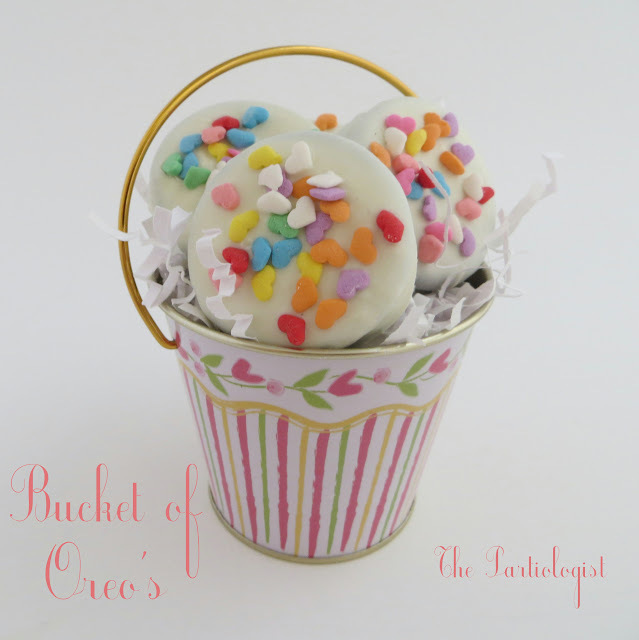 The first bucket holds white chocolate covered Oreo's. I sprinkled the heart confetti on top before they dried. 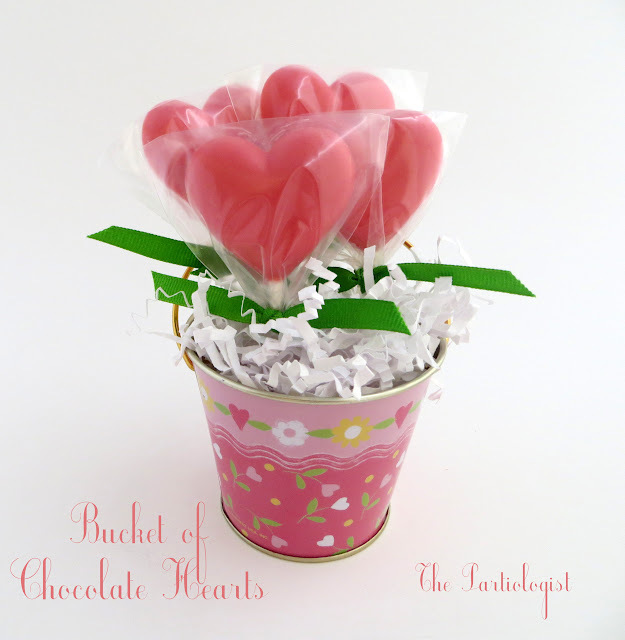 The center bucket holds pink chocolate heart flowers. I tied them with a green ribbon for the leaves! Using a heart shaped sucker mold, pour in the color of candy melts you wish to use. I added a little Styrofoam to the bucket and paper shred on top, now it's time to add the suckers! The last bucket is full of heart shaped soap. So you can wash your hands after eating all that chocolate. And I made it smell good too! I've never made soap before and was a little hesitant about trying it. It was entirely too easy and I'm hitting myself for waiting so long to give it a try. You can be sure I'll be making lots more soap. I found all of my soap supplies at Hobby Lobby and the heart mold is a find from last year (Target). 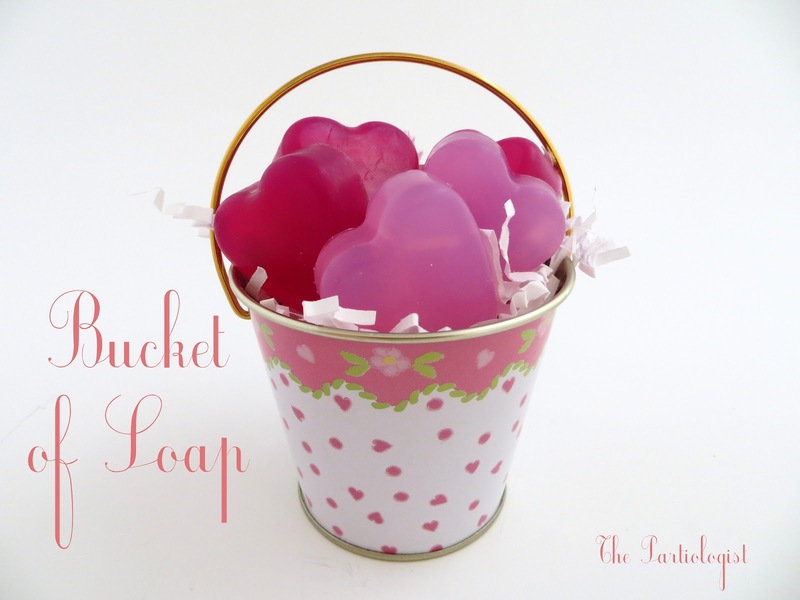 All you do is melt the glycerin in a microwave safe bowl, add scent and color, pour in mold and wait for it to set up. Only about an hour and then pop it out! EASY. PEASY. Chocolate Covered Oreos, Chocolate Heart Flowers and Heart Soap, OH MY!! I want to be your neighbor so I can watch the magic happen! Glad you are better but, wish you were 100% better! I didn't know soap was so easy or I would have been making it years ago! Thanks for the well wishes! Today I hope to be back in the kitchen baking again! All of them are just adorable! Perfect Valentine's Day gifts! Thank you for your sweet comment - glad you like them! 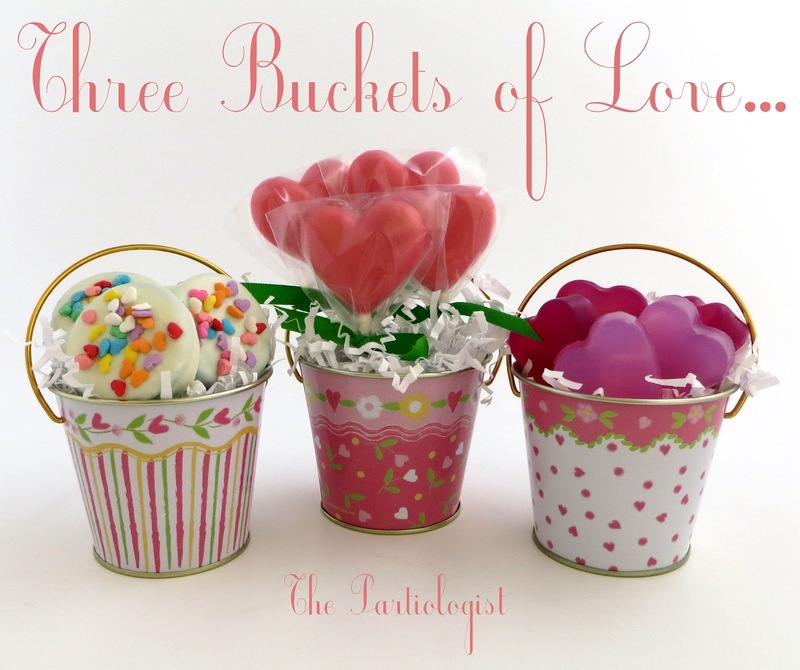 Love all 3 buckets - anyone would love them for Valentine's Day! !